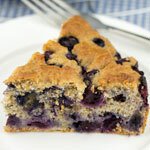 This low sugar blueberry cake is made with healthy whole wheat flour and sweetened only with unsweetened applesauce and fresh blueberries. After a few failed attempts at a blueberry cake, I went back to a cake recipe that worked really well, which is the Low Sugar Vanilla Pear Cake. I kept everything in the recipe the same, except instead of using pears, I mixed in 2 cups of fresh blueberries. The results were great! Preheat the oven to 375 F. Grease and flour an 8-inch round cake pan. In a large bowl, whisk together the eggs, canola oil, milk, applesauce and vanilla. Add flour mixture to wet ingredients and mix until blended. Gently stir in blueberries, do not overmix. Scrape batter into prepared pan and even out top. Bake for 40 minutes until brown on top and a toothpick inserted into the centre of the cake comes out clean. Place the pan on a wire rack to cool for 30 minutes. Run a knife around the edge of the pan to loosen cake. Turn cake onto rack and then invert onto serving plate right side up. For a sweeter blueberry cake, replace the 1/2 cup of unsweetened applesauce in the Mildly Sweet recipe above with 1/2 cup sugar. Most of the recipes on Sweet Smart are adapted from my favourite cookbooks and websites. The Sweeter Option usually calls for about 1/4 to 1/2 the amount of the sugar used in the original recipe. Adapted from: Country Pear Cake from epicurious.com.